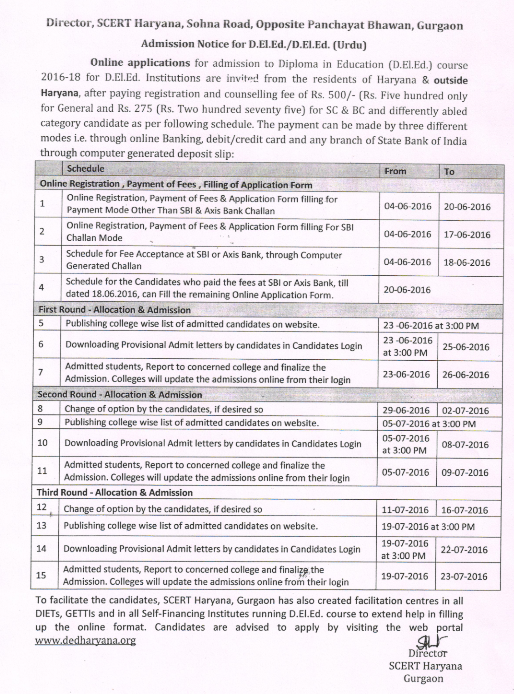 Online Registration, Payment of Fees & Application Form filling for Payment Mode Other than State Bank of India (SBI) and Axis Bank Challan-04.06.2016 to 20.06.2016. For SBI Challan Mode -04.06.2016 to 17.06.2016. Fee Acceptance at SBI or Axis Bank through Computer generated challan-04.06.2016 to 18.06.2016. Application fee can be paid by any branch of State Bank of India through computer generated slip,,Internet Banking and Debit/Credit Card mode. Admission in first round-College allotted on 23.06.2016 at 3:00 PM. Downloading Provisional Admit letters-23.06.2016 3:00 PM to 25.06.2016. Date for change of opted institutions-29.06.2016 to 02.07.2016. College allotted on 05.07.2016 at 3:00 PM. Report to concerned Institute and finalize the Admission process-05.07.2016 3:00 PM to 08.07.2016. College allotted on 19.07.2016 at 3:00 PM. Report to concerned Institute and finalize the Admission process-19.07.2016 3:00 PM to 23.07.2016. Facilitation centres situated in all GETTIs, DIETs, some selected Govt. schools and in all Self Financing Institutes running D.Ed. course. Counselling Fee-500/- for general category and 275 for SC/BC and PH candidates.